Added by Indo American News on October 13, 2017. STAFFORD: It was an almost surreal, deja-vu scenario that the Indo American Charity Foundation found itself in 7 weeks ago when Hurricane Harvey hit the Gulf Coast at Rockport and then dumped over 50 inches of rain on the five county Houston metropolitan area. Sixteen years earlier in 2001, Tropical Storm Allison flooded out the Texas Medical Center and many other areas of the Bayou City and southeast Texas for 15 days in June, dumping 40 inches of rain. Three months later, the World Trade Center attacks took place on September 11. The fourteen Board of Directors of the IACF posed after the Gala. 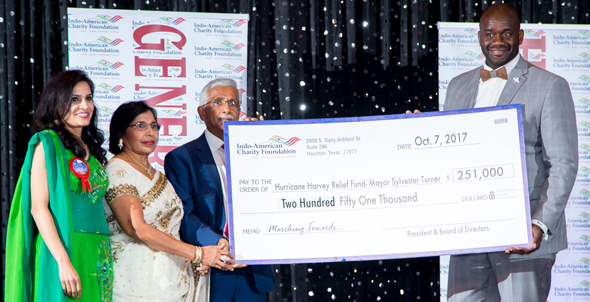 “We were reeling from the effects of these two tragedies,” recalled then IACF President Paul Likhari, “and didn’t think we would raise much money with our Gala slated for September 22 especially since many other organizations were doing the same.” Still, the IACF Board persevered and was able to raise funds to support several relief funds, including for the Gujarat earthquake that had occurred in January earlier in the year. The fifteen couples who formed the Angels of Charity and walked the runway in their finest attire at the conclusion of the Gala. She called the featured chief guest Swatantra Jain to tell him the board was considering cancelling the gala. 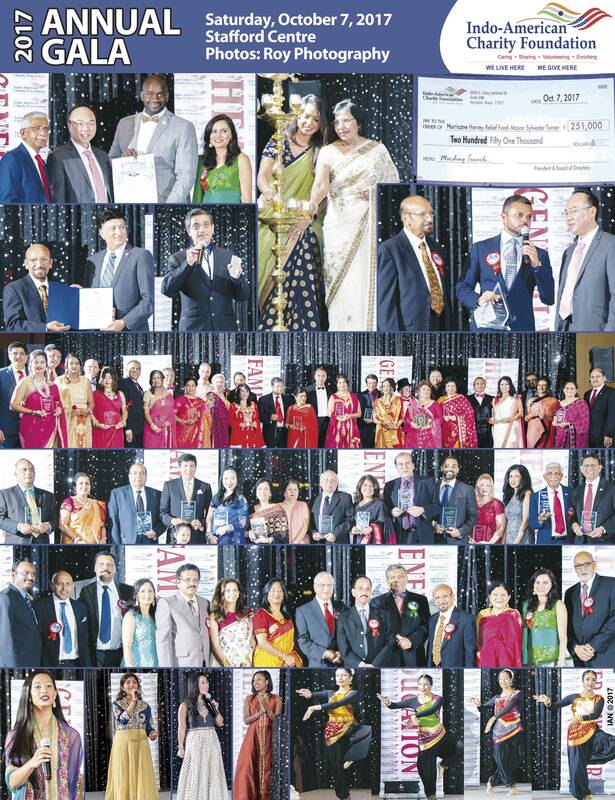 “Instead, he convinced me that we should go ahead and personally committed to raising funds and bringing in people to the event,” Pothuri said three days after the gala, exhausted from the hectic 30-day scramble to pull the gala together, now re-themed as for the “Harvey Relief Fund”. It was so hectic, in fact, that she didn’t even get a chance to write her speech. “On the day of the Gala, I kept thinking ‘I need to write my speech’, but never got a minute to do so.” So she winged it, extemporaneously, and delivered it from her heart, remembering “my four pillars” – her parents, Jain and the two people who have counselled her over the years: past IACF president Murthy Divakaruni and past IACF Executive Director Surender Talwar – for guiding her on the art of giving. All fifteen of the Friends of Charity onstage after they received their awards. Jain is been a well-known philanthropist among the Indian community, who has leveraged his successful career as a partner in Vinmar International, an over $5 billion petrochemical marketing and distributing company founded by Vijay Goradia, to help other charities. He is a principled man true to the values of his Jain religion and Punjabi heritage, serving as a founding member of the JVB Preksha Meditation Center on Schiller Road; a past president of Pratham USA’s Houston Chapter; and a board member of Magic Bus and the Indo American Chamber of Commerce of Greater Houston. He and his wife Bimla have donated generously to many local charities and his son Dr. Ajay Jain was on the IACF Board for several years. “I told Vanitha to go ahead with the gala and that I would personally donate $50,000 to the event,” said Jain about the meeting. 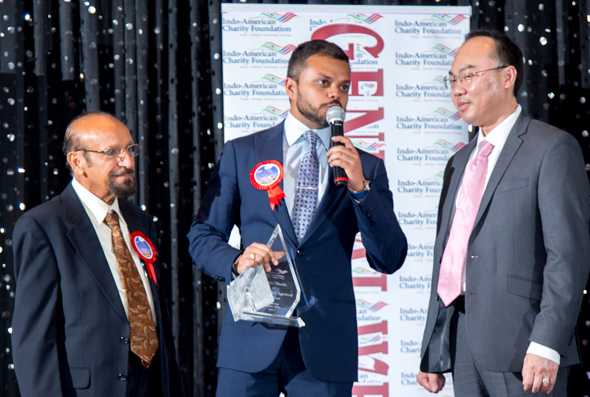 IACF President-Elect Mahesh Wadhwa (left) and Houston City Councilman Steve Le (District F) present Gala Chair Swapnil Aggarwal with an award. Despite being the chief guest, Jain also volunteered to raise another $50,000 and bring in many of his friends. Encouraged, Pothuri committed to $25,000 of her own and the Board went to work to raise more towards a goal of $200,000 and bring in many more people. Jain drew in a newcomer to the Indian non-profit scene as a Gala Chair, Swapnil Agarwal, a young real estate developer and financier, who committed another $10,000. At press time, Pothuri said that the totals were still coming in, but she expected a total of close to $300,000 was collected. Eventually, all the hard work for the IACF Board paid off as the Gala was a sold-out event of 600 people at the Stafford Civic Centre on Cash Road last Saturday, October 7. It featured the US national anthem and the song “Hero” by 14 year-old Chloe Choudhury; the Indian national anthem and a Hindi song by University of Houston student Srisanvitha Sridhar; emceeing by Chau Nguyen, the Chief Marketing Officer for the Houston Area Women’s Center and presentation of wards by Amber Elliot, the society writer for the Houston Chronicle. Jerry V. Davis (District B) and plaques of appreciation were handed out to Jain and Agarwal. Following an introduction of Indian Vice Consul General Surender Adhana, the Consul General Anupam Ray delivered a videotaped congratulatory message as he had to be in New Delhi for an emergency meeting. Well known classical dance exponent Ratna Kumar collaborated with author Chitra Divakaruni to perform a dance and poetry interpretation followed by four students from Kumar’s Anjali School of Performing Arts presenting a dance. The highlight of the program was the presentation of plaques for outstanding community work and support to the Friends of Charity, a staple item at the past two IACF Galas, to 15 individuals who walked across the stage to accept similarly inscribed plexiglass awards as Elliot read out their short biographies. The program concluded with a fashion walk down the runway, another IACF staple item, by 15 couples who also received plaques. A short Teddy Bear Pledge (another item from last year’s Gala) drive hosted by Dr. Subodh Bhuchar raised funds along with a silent auction set up on one side. Catering for the event was by Dawat Catering; photography by Roy Photography and music and sound by DJZee.